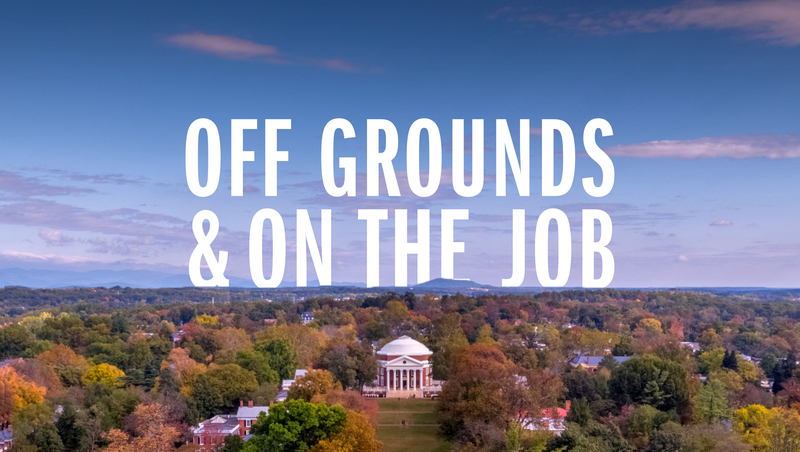 ach summer, thousands of newly-minted UVA graduates go straight from the Lawn to the workforce, where they don new titles, pick up new tools and test how well their UVA education prepared them. Like any new employees, all of them - the nurses, the engineers, the writers, the bankers, the teachers, the artists - are excited and nervous all at once. They are sad to leave their college years behind, but eager to see what their brand new careers will bring. Marta Moore started thinking about being a nurse when she was still a child. As an elementary schooler, she had to go into the hospital for surgery. She doesn’t remember much about the procedure itself, but she does remember how kind her nurses were. By high school, Moore was researching health care careers and volunteering in local clinics. Nursing, she realized, would give her the best opportunity to regularly interact with and support patients like her younger self. “I really liked the way that nurses got to work with patients and with their families so closely,” she said. 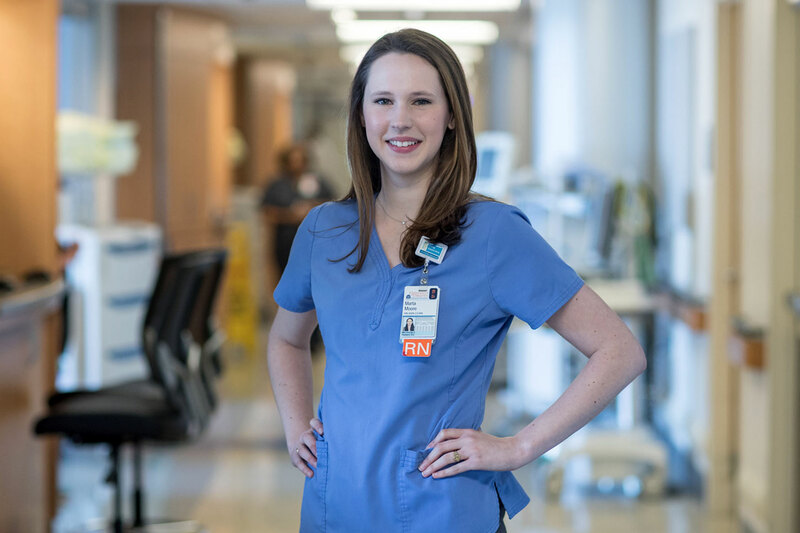 Now, Moore is a nurse in the Pediatric Intensive Care Unit at UVA, where she cares for patients from birth through age 18. Some of them are recovering from cardiac surgery treating congenital heart defects; some are dealing with respiratory issues; and some battle a host of different concerns. “It’s always changing. There is always something new,” Moore said. “Marta is a quiet leader, she is very approachable and she gets things done. She’s humble and just really wants to make the world a better place,” said Theresa Carroll, the senior assistant dean for academic and student services in the School of Nursing and one of Moore’s mentors. “All of those things make her an incredibly effective pediatric nurse, even when dealing with some really intense situations, caring for some of our sickest patients,” Carroll said. Because it is an intensive care unit, Moore and her colleagues face both happy moments – when patients recover from difficult procedures and can go on to normal, happy lives – and tragic ones, when some of their pediatric patients do not recover. In those emotional moments of loss, Moore relies heavily on her UVA colleagues. Moore also falls back on lessons of resiliency and compassionate care that were heavily emphasized alongside scientific and clinical knowledge in the School of Nursing. Programs like the UVA Compassionate Care Initiative, a collaboration between the schools of Medicine and Nursing that began in 2009, offer strategies, resources and programming to help medical professionals manage stress, respond to difficult, emotional cases and prevent burnout. “UVA really focuses on resiliency and compassionate care, and those skills were so important to me as a new grad,” Moore said. The lessons she learned help Moore to focus fully on the patient at hand rather than becoming overwhelmed by the tasks of the day, and to take a step back and take care of herself after an emotional case or difficult loss. As she begins her third summer on the pediatric unit, Moore is also looking ahead to her final year of graduate school. 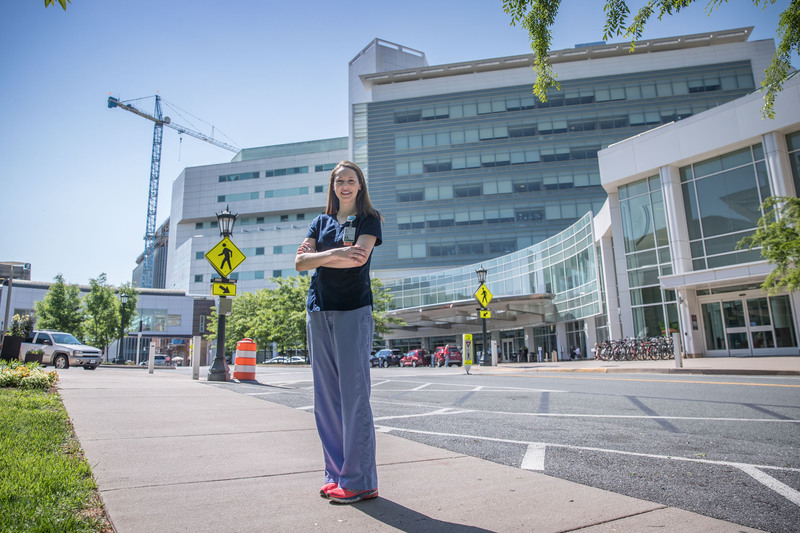 She has continued working while studying in UVA’s Pediatric Nurse Practitioner master’s program, specializing in acute care. “I have loved it so far,” Moore said of the graduate program. After a year of clinical studies, she will graduate in the spring of 2019 with the title of nurse practitioner. She does not know exactly where her career will take her after that, but she knows that she wants to continue nursing and working with children, who have the unique power to brighten even her toughest days. When he came to the University of Virginia, Atthar Mirza knew that he loved making movies, coding websites and creating intricate models. He did not know if he could roll all of those interests into one college degree. Until, that is, he discovered the design-thinking concentration in UVA’s School of Architecture. The concentration encourages students to think like product designers, analyzing how design and technology can help solve problems in a huge range of fields. Mirza soon immersed himself in everything from coding and webpage design to 3-D printing and virtual reality technology. One of his projects – a virtual reality experience that let people in Charlottesville put themselves in the shoes of migrants and refugees in Europe – was featured at the Virginia Film Festival. “I was able to focus on all of the skills that I wanted to use in a job one day,” he said. That day arrived quickly. Just a few weeks after graduating in May 2017, Mirza started working as an animation fellow at The Atlantic, the prominent Washington, D.C.-based publication that covers everything from politics to fashion. He works directly with The Atlantic’s video team on web development and animations like the one below – his current favorite – shedding new light on the creation of Leonardo da Vinci’s “Mona Lisa” more than 500 years ago. Mirza had a lot of responsibility on the project. He designed the animations, adapted the script and even narrated it himself. His work is indicative of traditional media companies’ growing interest in new media technologies, such as animation, augmented reality and virtual reality. For example, the New York Times debuted augmented reality coverage of the Winter Olympics, projecting lifelike images of the athletes into viewers’ living rooms through the New York Times app. Such projects – being undertaken at The Atlantic and across the media world – energize Mirza. Fellowships like Mirza’s are very competitive. The fellows, all recent graduates, are paid and work full-time. They participate in the program for one year, learning about many different aspects of the media company. Some stay on at The Atlantic, while others go on to different positions in media, technology and other fields. Mirza found out about the fellowship through a UVA career fair, where he met one of the coordinators. He applied shortly after and, to his surprise and delight, got the offer. “I did not really expect to go into news or media at the time,” he said. The more he considered the fellowship, though, the more he realized how well it fit with what he had been doing at UVA. 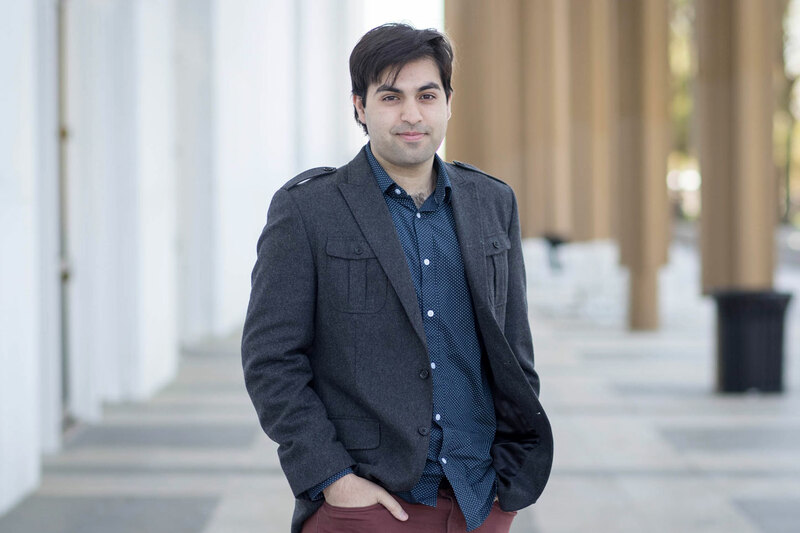 In addition to his classwork in the School of Architecture, Mirza was a student worker in the Robertson Media Center and the Digital Media Lab in Clemons Library, where he was something of a jack-of-all-trades. He worked at the front desk, helped students select cameras and other equipment for their projects and even taught a few workshops on animation software. He also took in a lot of advice from design-thinking professors like Cleckley. Mirza said Cleckley would often hold informal talks with graduating students, giving them advice for their first job and first year out of college. Now that he has been at The Atlantic for about a year, he’s starting to think about his next step. As an undergraduate student, Grace Zammitti got to know the University of Virginia’s iconic Rotunda better than most. 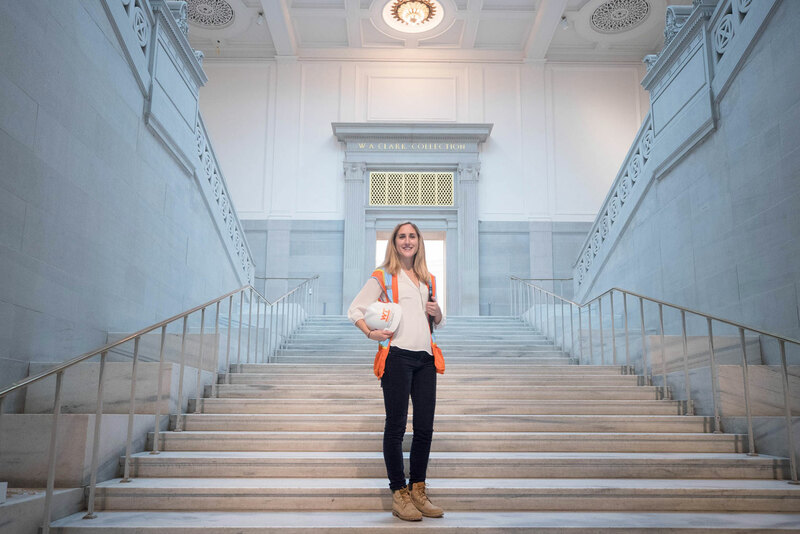 She spent the better part of two years as a student intern with UVA’s Facilities Management division, working alongside the architects, engineers and contractors who restored the University’s iconic centerpiece before it re-opened in 2016. Zammitti, who graduated in 2015 with a civil engineering degree and minors in architecture and business, called the internship “the pinnacle” of her UVA experience. She recalled walking by the construction zone around the Rotunda every day, wishing she knew more about what was going on. Then, Zammitti said, she realized she should simply ask. She approached faculty members in the School of Engineering and Applied Science and officials in Facilities Management to see how they would feel about letting a student on site. They thought it was a great idea. Zammitti’s work on the Rotunda solidified her future career path. As she sat in on meetings with architects and engineers, worked with historic preservationists on the new capitals and even joined the construction staff on the Rotunda roof, she knew she had found what she wanted to do. Nearly three years later, she is still building. 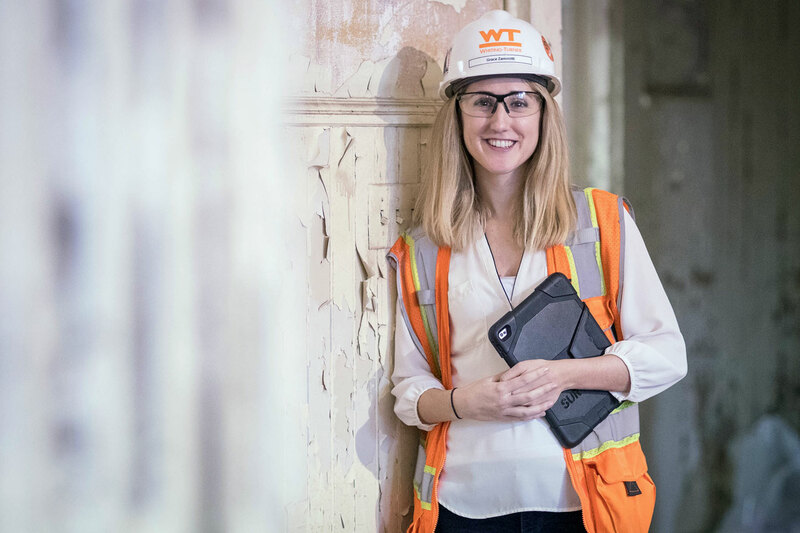 Zammitti is now an assistant project manager with The Whiting-Turner Contracting Company in Washington D.C. Fittingly, she mainly works on renovations of historic buildings. She recently completed a project at an art gallery, and is now working on a museum. Zammitti’s responsibilities include managing different subcontractors, such as electricians or demolition firms; keeping track of schedules and budgets; and working with her teammates to solve the myriad problems that crop up daily on any construction project. “It’s a lot of problem-solving. There is always something that you did not expect,” she said. For many of those problems, Zammitti relies not only on her education as a civil engineer, but on the business and architecture classes that she took for her two minors. Earning the engineering major and two minors required careful planning. Zammitti said she planned out her four-year schedule during her first semester – no easy feat for a first-year student. Now, she knows it was worth it. “I’m so glad I did that, because I think it made me a multifaceted engineer,” she said. Zammitti works with architects on a near-daily basis to understand their design and vision for a particular project, and the business minor helps her to keep a close eye on the financial health of each project. “I was able to tailor my education to my career goals, and that has really helped me,” she said. Looking ahead, she would love to move up the ladder and become a project manager, running construction projects on her own. “Right now, I am an assistant project manager, and I learn so much every day. I’m excited to get to a point where I know enough to run my own job and restore buildings with cultural and historical significance,” she said. For now, she is grateful that her first job has proved such a good fit for her skills and interests. “I feel like I got lucky in that I really love my first job and I can see a future and a career in this position,” she said. Often, the best part of University of Virginia alumnus Aman Mangalmurti’s week is time spent in local clinics with children and their parents. Mangalmurti, who graduated in 2017, now works at the National Institutes of Health in Bethesda, Maryland in the Post-Baccalaureate Intramural Research Training Award program. The neuroscience graduate is working in the Shaw Lab, a child psychiatry research group studying attention deficit hyperactivity disorder, or ADHD. The lab tracks groups of children over time, studying their symptoms and social environments and using neuroimaging to track how their brains are developing. Mangalmurti said they especially focus on creating and analyzing large data sets – big data is a growing emphasis in neuroscience – and on patients’ genetic makeup. At UVA, Mangalmurti worked in a laboratory led by neuroscience professor John Lukens. Among other things, Lukens investigates the root causes of autism spectrum disorders. Lukens, who still stays in touch with Mangalmurti, said he was an exceptionally talented and personable student. Mangalmurti said Lukens’ lab prepared him well for his current work. 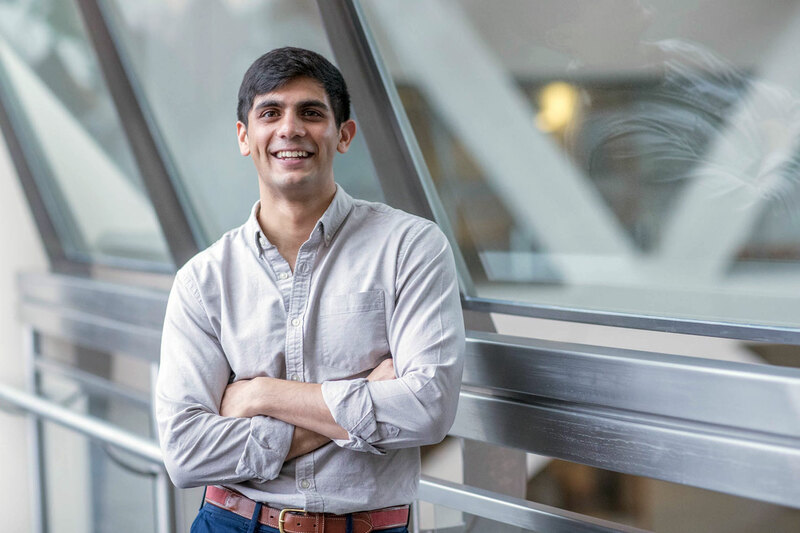 Though he just joined full-time last summer, Mangalmurti was already familiar with the NIH; he interned in the summer research program there after his first year at UVA. He spent another summer as the pediatric oncology education intern at St. Jude Children’s Research Hospital in Memphis, Tennessee. “I have always loved working with kids,” he said. At UVA, Mangalmurti spent several hours each week with local teenagers through the Men’s Leadership Project at UVA’s Maxine Platzer Lynn Women’s Center. Male undergraduate students serve as “big brothers” and mentors to middle school boys in Charlottesville, spending time with the boys at school and during other activities each week. The mentor-mentee relationships taught him a lot about communicating around difficult issues, Mangalmurti said, as did his time as a Peer Health Educator at UVA. Peer Health Educators are UVA students trained to talk with student groups about health and wellness issues like nutrition, alcohol and drug abuse or sexual health. “It required lots of public speaking and communication, sometimes about perhaps-sensitive issues,” he said. Those skills have come in handy at the NIH. 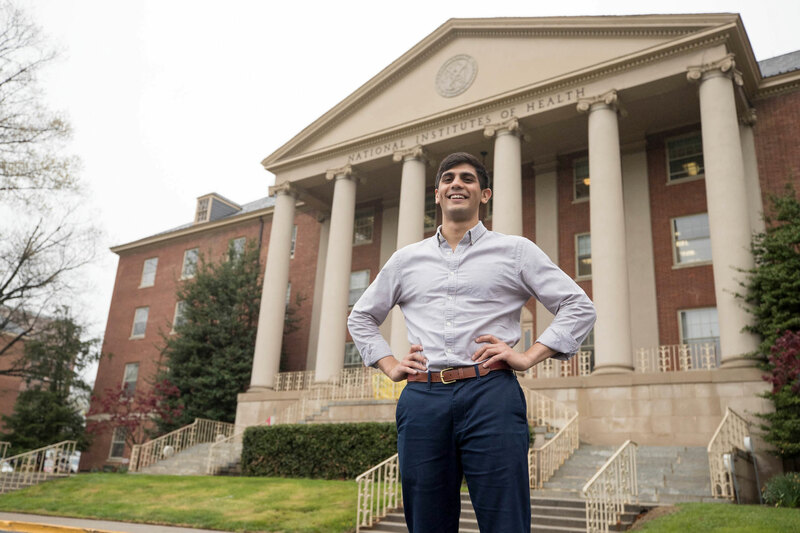 After his fellowship at the NIH ends this year, he hopes to enroll in an M.D.-Ph.D. program and continue gaining research experience, likely still focused on pediatric health. “One day, I would love to run my own lab, and perhaps be a professor,” he said. Lukens believes his former student has what it takes to have his job one day.